Arno van het Nieshof (AHR 16359-99) was imported from Holland as a yearling by Genesis Farm. 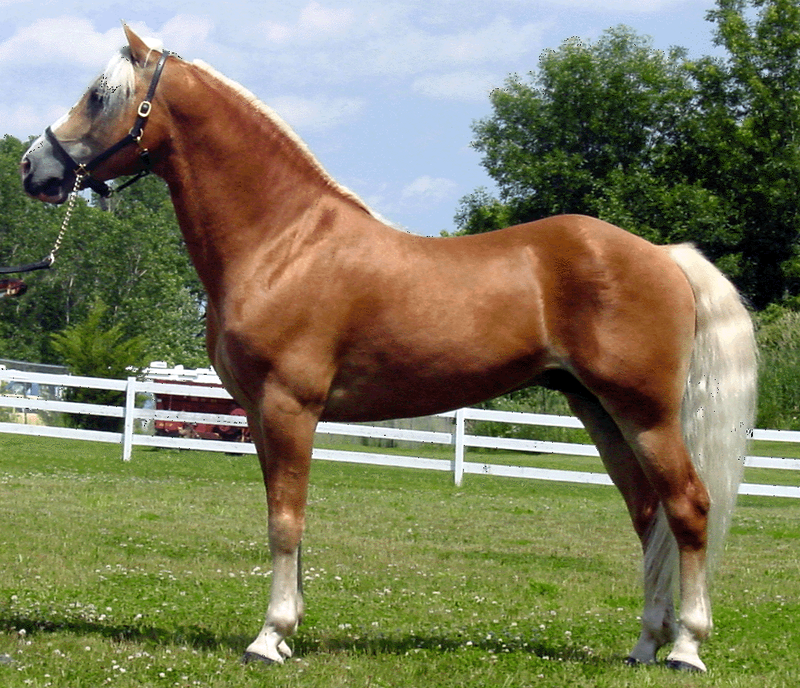 He is sired by the two-time National Champion of Belgium, Afloyd. His dam, Stefany, is sired by the National Champion of Holland, Magister. Arno also has numerous other Dutch and Austrian champions in his pedigree. With so many champions in his lineage, we knew that Arno would have a great influence on the haflinger breed here in the United States and Arno has certainly lived up to the legacy of his ancestors. 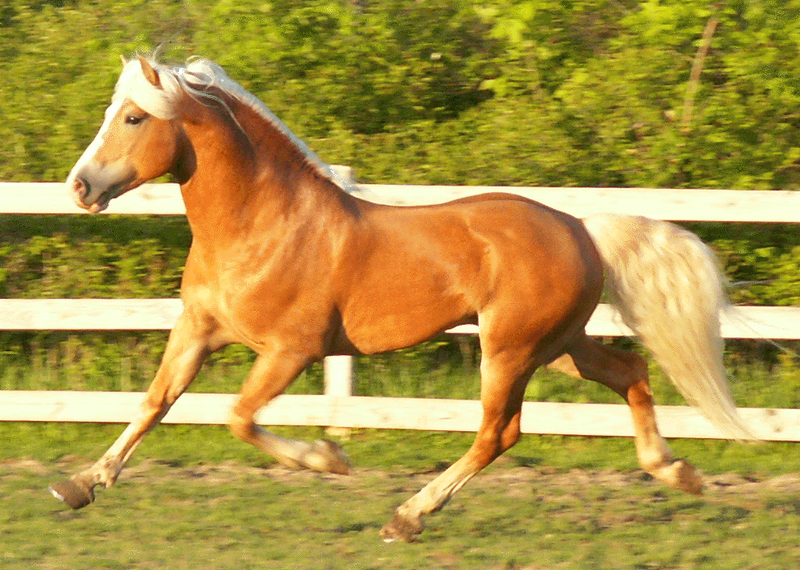 Since entering the United States, Arno has been the two time American Haflinger Registry National Champion Stallion, capturing those titles in 2001 and then again in 2004. 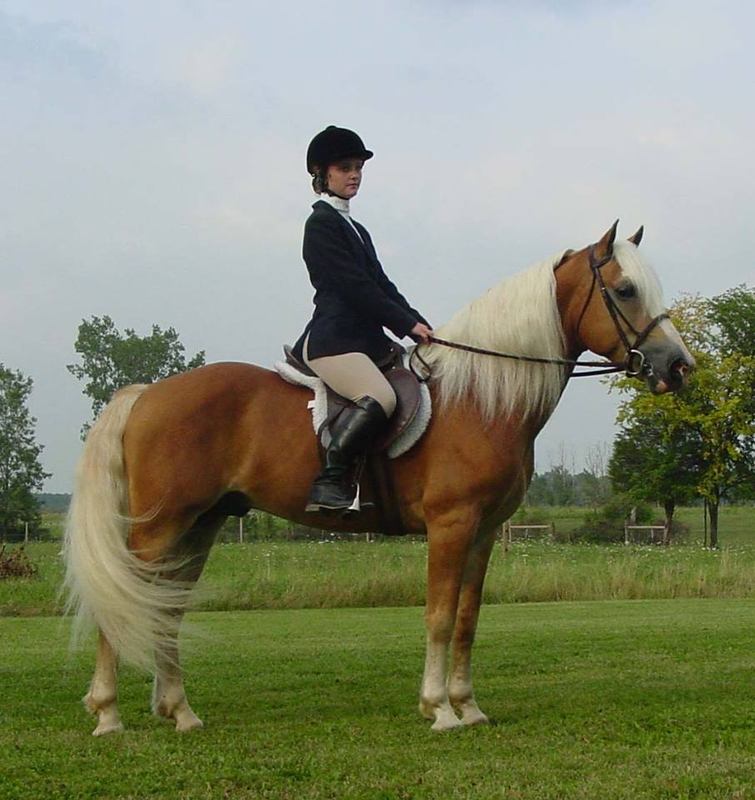 In 2007, at 8 years of age, Arno was the highest inspected haflinger at all of the AHR inspection sites combined. That same year, five of his offspring were classified and all five received high silver classification scores, earning Arno the title of “Star Stallion” by the AHR Inspection and Classification Committee. Perhaps even more impressive though is Arno’s ability to pass on his superior attributes to his offspring, including size, movement, refinement and temperament. These attributes contribute to the success of his offspring in halter and performance venues around the country year after year. Arno’s first foal crop was born in 2003. Since that time, his offspring have had a very significant impact on the breed and on show and sale results around the country. Arno’s name is synonymous with quality foals and the show results of his offspring are a testament to this. The achievements of Arno’s offspring in the show ring earned Arno the honor of being named the AHR “Stallion of the Year” for 2006, 2007, 2008 and then again in 2009! That means that Arno held the AHR ‘Stallion of the Year’ title for FOUR CONSECUTIVE YEARS!! Arno was the first stallion to have ever claimed this honor for more than one single year; holding this title for four consecutive years stands as just more proof of the quality of the foals that he produces. If you judge a stallion by what he produces, then Arno is a winner year in and year out. For a sampling of some of Arno’s offspring’s recognized accomplishments listed according to the year, visit Genesis Farm’s website. Each year, Arno’s breeding dominance is showcased through the exploits of his offspring. At the 2007 AHR National Show alone, he was the sire of both the Reserve National Champion Draft Mare AND the Reserve National Champion Pleasure Mares! His offspring also won the “Get of Sire” class in the draft division as well as the pleasure division! In 2008, one of Arno’s offspring (Magdalena BOB, owned by Genesis Farm) was the only mare to be classified GOLD at all of the AHR inspection sites combined! At the 2008 AHR National Show, Arno sired the Reserve Grand Champion Mare and the Reserve Junior Champion Mare in the pleasure division while also siring the Reserve Senior Champion Mare and the Reserve Junior Champion Mare in the draft division! His offspring won the National Pleasure ‘Get of Sire’ class! At the 2009 AHR National Show, Arno sired the Reserve National Champion Pleasure Stallion, the Senior National Champion Mare, the Junior National Champion Mare and the Grand National Champion Mare! Once again, Arno’s offspring won the National Pleasure ‘Get of Sire’ class on his behalf! At the 2010 AHR Inspections, Arno was the sire of the GOLD classified filly, ‘Faith by Fire’, who became the highest AHR Inspected horse ever in North America with an impressive and record-setting 83 points! In 2010, Arno earned the title of ‘AHR Elite Stallion’. He because only the second stallion ever to covet this honor; the other stallion is the well-known Aristocrat TOF. The title of being ‘Elite’ is given to stallions based on the accomplishments of their offspring. Also, in 2010, Arno’s offspring won the National Pleasure ‘Get of Sire’ class on his behalf for the 5th consecutive year! In 2011, Arno’s breeding dominance continued to prove itself. Among many other awards of recognition, Arno added two more AHR GOLD classified daughters to his list of accomplishments. There were only two AHR GOLD awards given out through the AHR Inspection and Classification system in 2011 and both of the recipients were sired by Arno. Limelight of Genesis, owned by Wingspann Haflingers in Oregon and Rosina of New Horizons, owned by Dream field Manor in Pennsylvania, were the recipients of the two GOLD titles. Also, Arno broke yet another AHR record when one of his gelding offspring, A Perfect Storm DAF, became the highest ever inspected AHR gelding with 78 points at the New York inspection site in July 2011. The pinning of two more AHR GOLD offspring for Arno in 2011, elevated him to the AHR ‘SUPREME Status’. In order for a stallion to receive AHR ‘SUPREME Status’, they must have at least 4 AHR GOLD inspected offspring and 2 or more AHR Silver offspring. Arno established another first in North America by earning ‘Supreme Status’ as he became the first, and currently remains the only stallion in North America, to ever achieve this rating! At the 2011 AHR National Show, Arno’s offspring won the pleasure ‘Get of Sire’ class on his behalf for the 6th consecutive year! Arno also sired the ‘Reserve National Champion mare’ and the ‘Reserve National Champion Stallion’ at the 2011 AHR National Show. At the 2011 AHR Futurity, Arno sired the highest placing SIP pleasure foal at the show out of 24 entries, Accolade of Genesis! At the 2012 AHR National Show, Arno’s offspring again demonstrated their sire’s acclaimed quality. Arno sired the AHR ‘National Champion Stallion’, the AHR ‘Senior National Champion Mare’, the AHR ‘Junior National Champion Mare’, the AHR Overall ‘National Champion Mare’ and the AHR National ‘Best of Show’! In addition, his offspring won the National ‘Get of Sire’ class on his behalf for the 7th consecutive year!! At the AHR Futurity, there were over 20 entries in the pleasure SIP Class and there were only three of Arno’s offspring in the class yet they stood 1st and 2nd place overall! The filly he sired, Rumor Has It of Genesis, was named the overall SIP Champion. At the 2012 AHR Inspection, Arno sired the highest scoring horse of the year with 79 points. At the 2012 American Warmblood Society Inspection in Michigan, two of Arno’s daughters had the privilege of showing spectators what a well-bred modern sport haflinger could look like. The GOLD and the SILVER medals at the Inspection were awarded to these daughters of Arno, who placed far above all of the other horses and breeds represented at the Inspection site! Later in the year it was announced that at the National level for the American Warmblood Society, the 2-year-old filly, Aura of Genesis, was the 2nd highest scoring 2-year-old filly in the entire country over all of the other breeds! At the 2013 AHR National Show, Arno’s offspring once again made him proud. Arno sired the ‘Senior National Champion Mare’, the ‘National Champion Mare’, and the overall ‘National Best of Show’. At the AHR Futurity, Arno made a clean sweep of the blues! Arno sired the 1st place 3-year-old, the 1st place and Champion 2-year-old, and the 1st place and Champion Yearling. This means that Arno’s offspring won all three age divisions! In 2013 though, Arno only sired one foal in the entire country. But, not to disappoint, this young filly that was born in May still was named the 1st place Junior Weanling Filly and the Reserve Junior Champion Weanling. UPDATE: This 2013 filly, Limited Edition of Genesis was just awarded Gold at her classification in July 2016! In 2014 another Arno filly, the beautiful Aura of Genesis was awarded Gold, and Accolade of Genesis was awarded high silver with 80 points. In 2015 two more mares by Arno, Mint Celebration of Genesis and Radiance of New Horizons, were also awarded Gold, each with 82 points! Additionally two Arno mares achieved Silver status, Rendezvous of Genesis and Myriam GHJ. And in 2016 Arno mare Limited Edition of Genesis was awarded Gold and Rumor Has It of Genesis achieved Silver status. And I’m sure this list of Arno’s will go on and on in the future!